The hottest industry of 2017 is back for more. Semiconductor stocks have returned to the top of Wall Street in the first few months of 2019. The Direxion Daily Semiconductor Bull 3X Shares (SOXL) has more than doubled year-to-date, making it the best performing of Direxion’s suite of Leveraged ETFs. Source: Bloomberg. Data as of 4/12/19 . Past performance is not indicative of future results. Investment return and principal value of an investment will fluctuate so that an investor’s shares, when redeemed, may be worth more or less than their original cost. Current performance may be lower or higher than the performance data quoted. For standardized performance and the most recent month-end performance, click here. 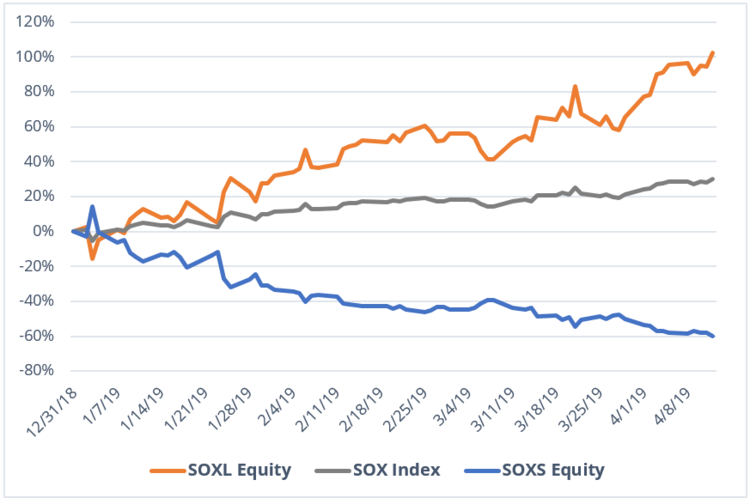 Among the main reasons SOXL has surged over the course of the first four months of the year is the apparent resilience of the Chinese economy in the face of slow growth projections. Throughout 2018, semi stocks struggled to break out largely due to the uncertain effects the U.S.-China trade war might have on both Chinese manufacturers and consumers in a year when China’s GDP slowed to its slowest pace in 30 years. Disappointing sales in the country from chip-buyers Apple Inc. and automotive companies like General Motors and Ford only added to the anxiety semiconductor investors felt under tariffs that specifically targeted microchip component exports from the country. However in 2019, it’s as though those concerns have evaporated entirely. Part of this is due to Chinese PMIposting a healthy rebound in March after a slow February. Another aspect is simply the fact that the trade war has remained in a relative stalemate, with rumors suggesting some progress has been made in the nearly year-long conflict. Finally, there is also the matter of accommodative economic policy aiding companies on both sides of the conflict, as the Federal Reserve put the kibosh on its interest rate increases for the time being, and China’s central bank injected 50 billion yuan into the economy to encourage greater lending. On balance, little has actually changed for the semiconductor stocks and 2019’s second quarter might be the time to re-evaluate the strength of these companies, as many look to report earnings in the coming weeks. 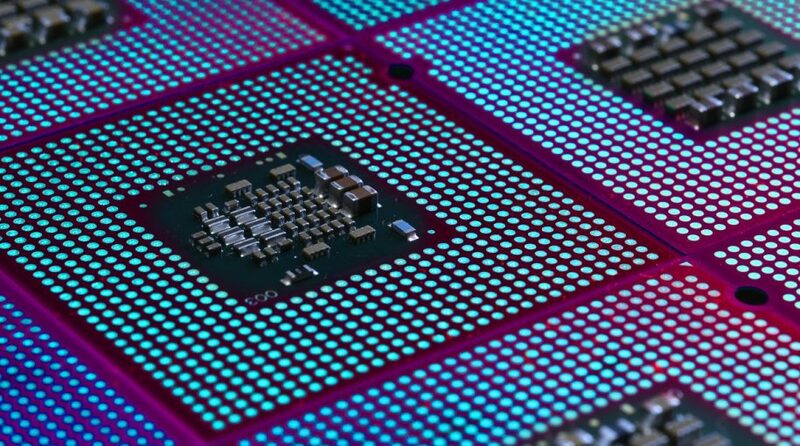 For context, the industry’s fourth-quarter results were far from a blowout, with half of the largest components of PHLX Semiconductor Sector Index (SOX) reporting top line misses, including Intel Corporation, Advanced Micro Devices, and Qualcomm. It should also be noted that during a recent earnings call, Broadcom CEO Hock Tan commented that, although optimistic, he does see semiconductor sales finding a bottom in the second fiscal quarter due to cyclic trends in the industry. Similar, or even direr, commentary populated the most recent guidance from Micron Technologies and Applied Materials. At the moment, earnings and a trade deal between the U.S. and China are the two biggest catalysts that could tip the scales on the semiconductor industry. Since progress on a final deal remains vague, earnings are the biggest near-term influence to which investors should pay close attention. Disappointing sales could present an opportunity for those contrarians that trade leveraged inverse semiconductor ETFs like the Direxion Daily Semiconductor Bear 3X Shares (SOXS). Incoming reports from Lam Research Corporation and Taiwan Semiconductor promise to provide indications on whether the current rally in semiconductors still has legs. But given the trend among many of these companies in previous quarters, investors shouldn’t expect the industry as a whole to present blowout figures. This leveraged ETF seeks investment results that are 300% of the return of its benchmark index for a single day. The ETF should not be expected to provide returns which are three times the return of its benchmark’s cumulative return for periods greater than a day. Investing in a Direxion Shares ETF may be more volatile than investing in broadly diversified funds. The use of leverage by an ETF increases the risk to the ETF. The Direxion Shares ETFs are not suitable for all investors and should be utilized only by sophisticated investors who understand leverage risk, consequences of seeking daily leveraged investment results and intend to actively monitor and manage their investment. SOXL/SOXS Risks – An investment in each Fund involves risk, including the possible loss of principal. Each Fund is non-diversified and includes risks associated with the Funds’ concentrating their investments in a particular industry, sector, or geographic region which can result in increased volatility. The use of derivatives such as futures contracts and swaps are subject to market risks that may cause their price to fluctuate over time. Each Fund does not attempt to, and should not be expected to, provide returns which are three times the return of their underlying index for periods other than a single day. Risks of each Fund include Effects of Compounding and Market Volatility Risk, Leverage Risk, Counterparty Risk, Intra-Day Investment Risk, and risks specific to the Semiconductor Industry, such as Large-Capitalization Company Risk, Small- and/or Mid-Capitalization Company Risk, for the Direxion Daily Semiconductor Bull 3X Shares, Daily Index Correlation/Tracking Risk and Other Investment Companies (including ETFs) Risk, and for the Direxion Daily Semiconductor Bear 3X Shares, Daily Inverse Index Correlation/Tracking Risk, and risks related to Shorting and Cash Transactions. Please see the summary and full prospectuses for a more complete description of these and other risks of each Fund.